It was probably around 1986 when my curiosity developed towards Welling United Football Club. I was given a programme from a game against Fareham Town and for whatever reason it struck a chord. It was also the era of the old Non-League Grounds publications, and when I saw a photo of the Park View Road ground, I liked what I saw, it was a traditional football ground, in an era when such beauties were starting to go by the wayside, notably inside the confines of the M25. I’ve never actually seen them play though until today. I did once turn up one night at Ilkeston Town for an FA Trophy game just after it had been postponed, while on the couple of occasions they played at Alfreton Town in the Conference National, I was clearly somewhere else! 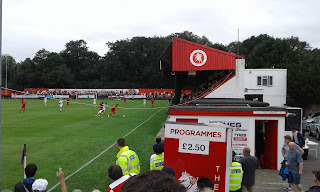 Visiting Park View Road has been on my agenda for a long time, but being a man of the completist variety, Welling United have never been in a league that I try to crack the champagne corks over. 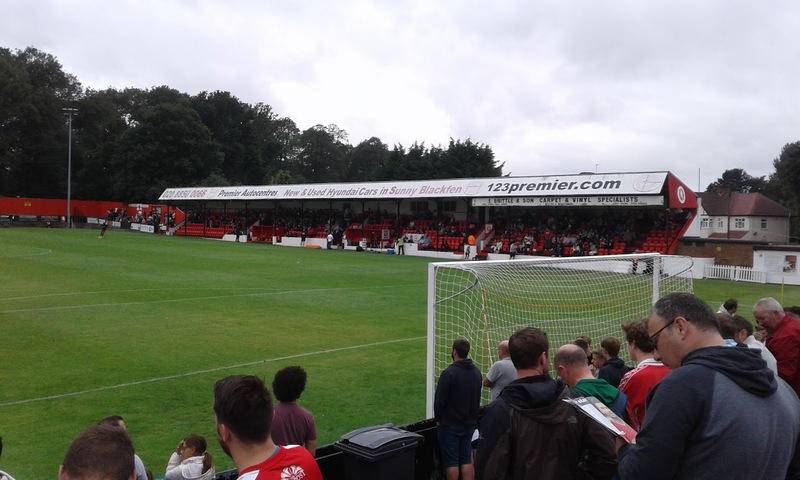 Today’s visit was not the original plan either, some weeks ago, before the pre-season schedules had been finalised, I booked some very cheap rail tickets to London, and the hope was to get to one of the remaining Football League grounds I needed to visit. As it turned out Fulham were not playing, and Charlton Athletic were away, at Welling United. Immediately that fixture stood out, the chance to visit had arisen, so the planning started. It was relatively straightforward in the sense that the Euston bound train from Birmingham meant I was having a beer in Borough Market by 11am, and this meant the regular trains from London Bridge to Welling were a mere five minute walk away. Borough was a busy place, traders were kept busy as curious onlookers meandered. Not so long ago this was a scene of devastation, but normal service looks to have returned very quickly as we refuse to allow the extremists to change our way of life. A few scoops later and it was on the train to Welling, just a short 25 minute journey into Kent through Lewisham, Blackheath and Eltham, before disembarking the train onto the busy High Street. Charlton fans were already in the pubs as a precautionary Police presence patrolled the area. I chose to enter the ground and it was there that I soon met Peter Mason, who ran the clubs programme shop. We chewed the fat for a good half hour as he gave me some background on the club, and I browsed his wares. Peter was a hugely friendly and enthusiastic chap, so if you do ever visit Park View Road, look him up. If you are reading this Peter, thank you, and I won’t forget….! What a superb ground, in my eyes anyway. 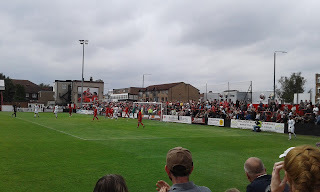 You can sense the history by looking across it, and from my vantage point on the terraces behind the goal, you had great views across an expanse that not only Welling United call home, so do Erith & Belvedere, and this is where it gets a bit strange! 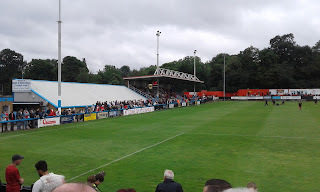 One side of the ground contains the old seated stand that is something of an iconic structure, with the social club and offices situated behind it. Behind both goals are open terraces, but then the opposite side is all about Erith & Belvedere. The social club, the tea bar and the stand are all very clearly belonging to them. So we have a non-league ground with two separate social clubs, and catering facilities, that are clearly defined and serve to support themselves. Bizarrely as well, the two teams emerged from either side of the ground, I don’t know whether that is normal or just the plan for today? 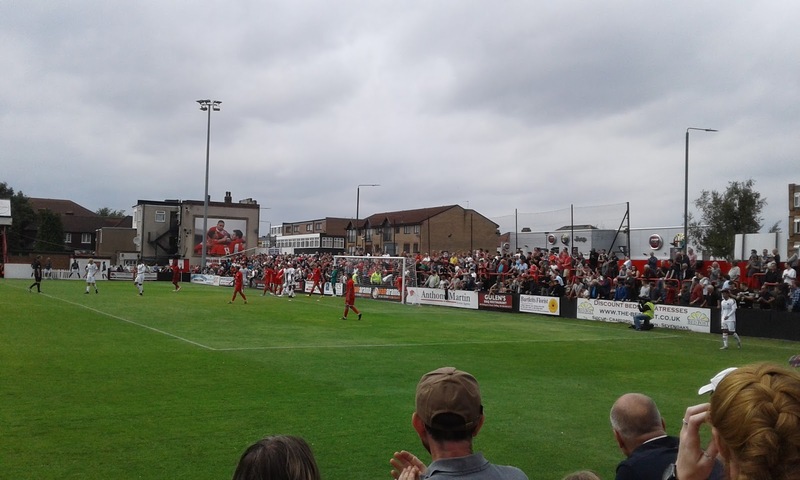 Erith were clearly not wanting to miss out on the windfall nearly 1,500 spectators would bring so they had taken the decision to open up today, and to be fair, looking at the queues for both bars, it was probably a good job they did. I had a pint in each for the sake of keeping the peace! But, quirks aside, it really is a fine venue, unspoiled by the power of the developer and the Atcost. I can imagine on that cold December Saturday with the light fading, when an unsuspecting Football League side pitches up for an FA Cup tie, with a full house tight to the pitch, it can be quite an atmosphere. Those days have gone before, and no doubt under new ownership, the hope is that those days will return. A recent three season spell in the Conference National has caused some financial hardship, and being a small fish in a big pond as was, it has and will take time to recover. But hope springs eternal as they prepare for another season in Conference South. Welling played well, but the strong Charlton side had the finishing power. Two first half goals in front of a large travelling support set the tone, and then a third goal came with just three minutes remaining. 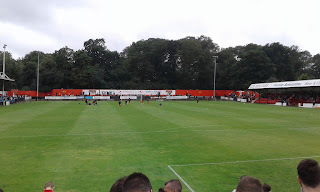 It was a good workout for both sides, and in fairness to Charlton they send a strong side to Park View Road every season for what is now a traditional curtain raiser. I had no time to hang around at the final whistle, and I just made the 5.03 back to London Bridge, which allowed me some chill time in All Bar One at Euston, and a moment to reflect on the day. It had been great, Park View Road did not disappoint and was worth the very long wait. The journey back was an epic one, I finally disembarked the bus at the bottom of my road just before 11.30, but this is the price you pay with ticket splits and such like, they may be cheap but they aren’t especially direct or timely. But if your sole objective is a few beers and the football, it really doesn’t matter.